Heroic achievement in the superior performance of his duties while serving as Platoon Sergeant, Company K, 3d Battalion, 3d Marines, Regimental Combat Team 1, I Marine Expeditionary Force (Forward) from August 2007 to February 2008 in support of Operation IRAQI FREEDOM. While conducting combat operations in the Al Anbar Province, Staff Sergeant Fernandez admirably led his platoon in the execution of more than 150 combat patrols and 25 logistic convoys. On 19 September 2007, after being targeted by an enemy coordinated attack, he unhesitatingly directed the fires of his turret gunners toward enemy insurgents, who were attempting to engage the convoy with rocket propelled grenades and small arms fire. His quick and decisive action denied the insurgents the ability to effectively engage the convoy. His exceptional attention to detail and awe-inspiring courage under fire forced the enemy to break contact. 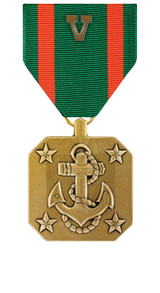 Staff Sergeant Fernandez’s initiative, perseverance, and total dedication to duty reflected credit upon him and were in keeping with the highest traditions of the Marine Corps and The United States Naval Service.